Please refer to our stock # 3514 when inquiring. This small Shoushan stone (寿 山 石) carving is an early 20th century product. It is 2 ¼” high, 2 ¾” wide and 1 ¾” thick. 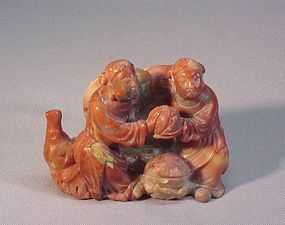 It depicts two immortals He-He Er Xian (和 合 二 仙) also known as the “two spirits of Harmony and Union" sitting next to each other. Two straw hats rest on their backs. They hold a small woven round box in front of them; another large box is sitting nearby. A tiny lucky bat is trying to escape from the small box. Aside from a few small scratches, it is in good condition.